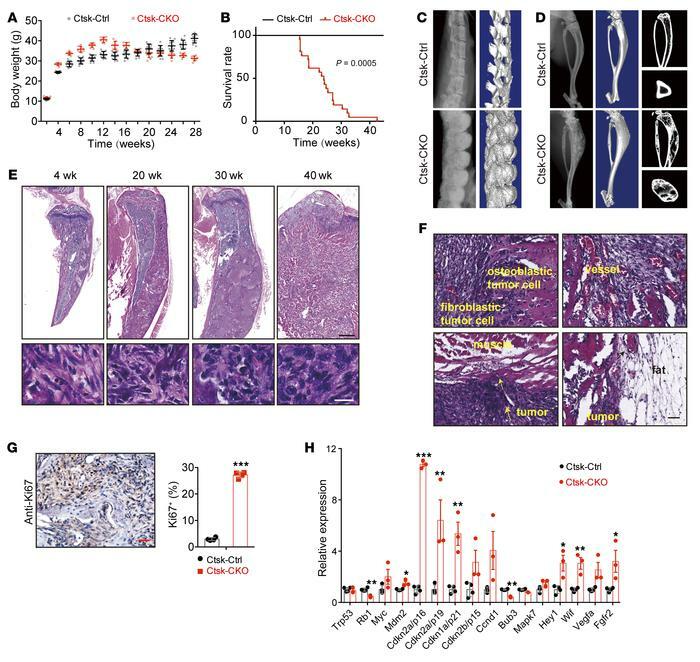 Lkb1 deletion in Ctsk-Cre–expressing cells causes osteogenic tumor–like phenotype. (A) Body weight plots of Ctsk-Ctrl (n = 10) and Ctsk-CKO (n = 8) male mice. (B) Kaplan-Meier survival plots of Ctsk-Ctrl (n = 31) and Ctsk-CKO (n = 21) mice. (C and D) X-ray images and μCT scans of the spines (C) and tibiae (D) of 20-week-old Ctsk-Ctrl and Ctsk-CKO mice. (E) H&E staining of tibiae from 4-, 20-, 30-, and 40-week-old Ctsk-CKO mice showed a progressive histopathological feature. Scale bar: 1 mm (upper panels); 20 μm (lower panels). (F) Tumor in the tibiae of Ctsk-CKO mice was composed of fibroblastic and osteoblastic cells with abundant blood vessels. It invaded into the adjacent muscle and fat tissues at an age of 40 week. Scale bars: 50 μm. (G) Immunostaining of Ki67 in the tumor osteoid displayed a hyperproliferative characteristic. Scale bar: 50 μm. Similar results were obtained from analyses of both male and female mice for each genotype. (H) Gene expression of human osteosarcoma-related genes in the cortical bone of tibiae from 20-week-old female Ctsk-CKO mice (n = 3) compared with normal Ctsk-Ctrl mice (n = 4). Data are represented as mean ± SEM. *P < 0.05; **P < 0.01; ***P < 0.001, unpaired Student’s t test.